A must have piece of equipment for any restaurant, deli, or butcher shop. Ensure that all of your knives are properly sharpened, to avoid the risk of using a dull knife. 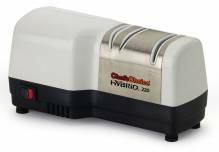 Chef’ Choice manual, electric and hybrid knife sharpeners available for any sized establishment. Can’t decide between electric or manual sharpening? You don’t have to choose! Hybrid models feature both electric sharpening and manual honing and re-sharpening. These machines are fast an easy to use, without having to have knowledge of how to properly and manually sharpen a knife! Sharpening stones and steels also available. Remember: if you leave them too long, it’ too late; respect your knives!